Our experience has enabled us to have worked with the largest Grid Operators in the United States. Listed below are several examples of publicly available reports and statistics. 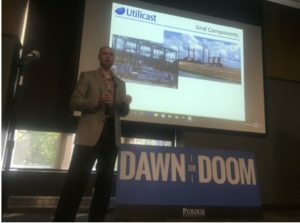 Chris Unton presented at Purdue University’s Dawn or Doom technology conference. As leader of Utilicast’s Compliance Practice, he shared his “Understanding the Perils of our Power Grid Security.” His presentation included history, risks, and infrastructure related to the security of our electricity grid. David McGinnis and Dr. Kiamran Rajabli presented a paper on Future State Visualization at the EEEIC conference in Palermo, Italy. The research was done in collaboration with Ameren and ERCOT. As part of the research, visualization software was developed. The software enhances visualization of the future power system state. The implemented features encompass advanced future state monitoring, transmission reliability index, dashboard, global system-wide alarms, and rendering of the forecasted weather and power system state data on GIS maps. Overview of Distributed Energy Resources and their impacts on Grid Operations – This paper takes contemporary information and reports from both the Independent System Operator (ISO) and distribution levels, and attempts to define a path to integration – not from a policy or conceptual viewpoint, but from an operational, reliability and market standpoint. The paper attempts to identify issues that have or may arise as DER growth develops and integration with the transmission grid increases. Issues and potential solutions are covered at a high level with the hope that this paper may lead to a more detailed discussion on specific issues. A principles-based approach to Energy Industry security challenges. Utilicast’s Dr. Kiamran Radjabli was recently published in the International Journal of Applied Physics and Mathematics for his mathematical work in the areas of Analysis of Sparsely Populated Sets and Attributes of Infinity. In the operation of today’s power systems, renewables (especially solar and wind) are becoming a larger and larger part of the generation mix. While renewables are desirable for their low variable costs and for their low environmental impact, they can and do cause problems in day-to-day system operations. The most notable of these is illustrated by the “duck curve” where renewable outputs offset demand producing a “duck’s belly” during normal maximum load periods as shown in the figure below and then cause higher than normal ramping needs when the sun goes down (“duck’s head”). Utilicast’s strength is helping clients implement complex solutions “from cradle to grave.” One example of this is our work in the area of Next-Generation Contingency Analysis. In 2015, Utilicast partnered with a Midwest utility to develop new algorithms to forecast issues on the electric grid. Utilicast’s Dr. Kiamran Radjabli was published on this topic and presented his paper at the Power and System Engineering Conference in Japan in September 2015. In 2016, the utility hired Utilicast to develop and deploy these advanced algorithms into their System Operations. On the request of MISO and PJM, Utilicast produced a document to support the Joint Operating Agreement (JOA) Baseline Review. Efficient Dispatch Toolkit cost analysis; Utilicast was asked to assess the costs associated with deploying the Efficient Dispatch Toolkit (EDT) across two candidate footprints within the Western Interconnection. Utilicast nodal program oversight report on a newly integrated scheduling and budget assessment.